emma lamb: colour palette : spring at last! colour palette : spring at last! Hi guys! Happy, happy Friday to you all! It is so lovely to finally have the spring here, it makes me happy! Not that I didn't enjoy this last winter, it was so much better than our usual British winters of relentless dreary dull greyness. Yes there was a lot more snow and it was a wee bit colder than usual but there was also tons of bright sunny days. Usually in February I'm crawling the walls with the miserable winter blues, but not this year! Despite all that it's still kinda good to know that it won't get really chilly again till next winter. Ha! I do hope you are loving all of today's colour palette images, they are some of my absolute favourites from Flickr at the moment. Of course Ciel's yummy macaroons come top but I'm also loving Kristybee's pretty pink English Roses. 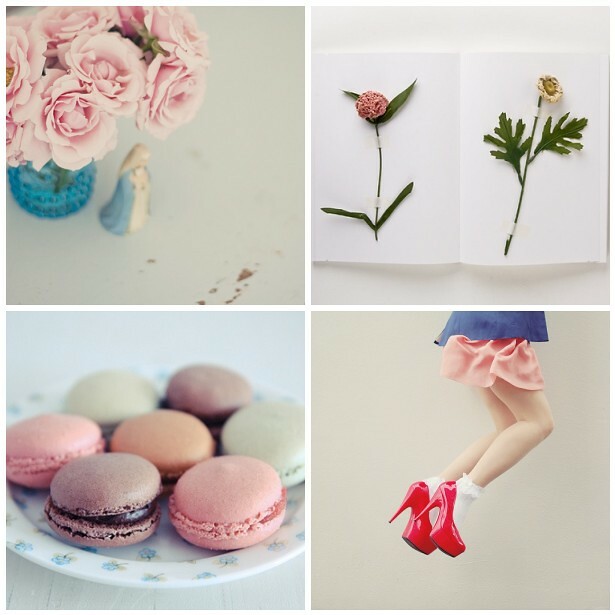 Please do check her lovely Etsy shop for more of her beautiful floral photography. All of her prints are on a 40% sale just now, so if you are looking to spruce up you own picture wall for this spring you could bag yourself a wee bargain. ps : 7 days to go, eek!!! Beautiful colors and the macaroons look so yummy I can't stand to look at them but I keep looking! Those red shoes are so over the top. Not your typical Dorthy ruby silpers, LOL. Loved the colors! I love a spring pallet, and I am so happy spring is here too, it totally changes the way I feel. Macaroons rock my world - cute :) - what a tempting palette - love it.